The internet arouses affection and fear. 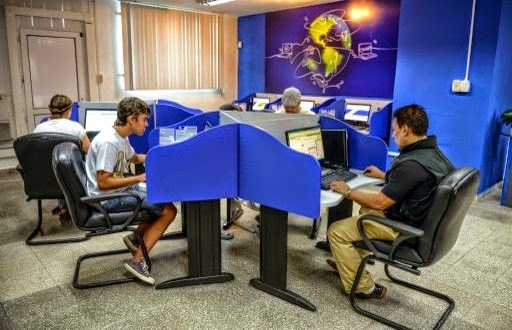 Iván García has posted a great description of the Cuban "computer rooms". (As he notes, there is no good English translation for "salas de navegación"). On average, each internet room has received 7,600 customers a month in the first 12 months. Some 250 internet users a day. 25 an hour: the internet premises are open 10 and a half hours every day of the week, from 8:30 am to 7 pm. Of the blogs or webs originating in Cuba, like Primavera Digital, out of every 100 people consulted, only 9% said they copy the contents onto a pendrive to read later at home. A technician tells me that, right now, the Ministry of the Interior (MININT) has a fleet of vehicles equipped to detect illegal internet signals and cable satellite channels. The connection speed can’t be compared with what you find in other countries: between 512 Kb and 2 Mb. For those who like to read the international media, the favourites are the BBC, El Pais and the Financial Times. Of the Cuban pages, the most visited are Diario de Cuba and Havana Times, and, of the Miami newspapers, El Nuevo Herald and Diario de las Américas. I better stop before I copy the entire post -- go read it for yourself.